L’Ame d’un Héros, the Soul of a Hero. 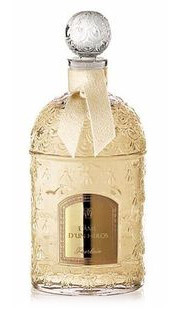 A part of Guerlain’s Les Parisiennes line, L’Ame d’un Héros is a bee bottle exclusive of a previously discontinued scent. It is billed as a men’s fragrance but smells versatile enough for both genders to pull off. In Bottle: Fresh and crisp citrus and aromatic scent with a touch of woodsiness in the bottle. Applied: Opens with lemon and sage and that dry, citrus sophistication of bergamot. L’Ame d’un Héros crashes into the mid-stage with a smooth and excellently blended heart of green aromatics with a juniper dominance. The dry down is a fantastic, subdued dry resinous fragrance. This isn’t like the many different mainstream fragrances that are billed as masculine or sporty. L’Ame d’un Héros is similar in concept but the execution takes it a few steps up. As with most Guerlains, it is a well-blended and complex mixture that just makes it smell better. Extra: L’ame d’un Heros is a remake of Guerlain’s 1998 men’s fragrance, Coriolan. Coriolan is discontinued and it smells very similar to L’ame d’un Heros except for its strength. If you are looking for a lighter, more refined and subdued scent, L’ame d’un Heros is your fragrance. If you want power, projection and confidence, go get yourself a bottle of Coriolan. It should also be noted that Coriolan is much cheaper and is becoming more and more scarce on the second hand market. Design: L’Ame d’un Héros like the rest of Les Parisiennes is bottled in a beautiful iconic bee bottle. Notes: Sage, neroli, bergamot, lemon, wormwood, cypress, juniper, basil, ylang-ylang, amber, patchouli, woods, vetiver. I personally prefer the scent of L’Ame d’un Héros over Coriolan–but only because L’Ame d’un Héros is a quieter fragrance. Reviewed in This Post: L’ame d’un Heros, 2008, Eau de Parfum. This entry was posted in aromatic, guerlain, Reviews By House, woodsy and tagged aromatic, coriolan, dun, fragrance, fresh, green, guerlain, herbal, heros, lame, lame dun heros, les parisiennes, woodsy. Bookmark the permalink.